It’s actually quite a tough brief, and ending having me think about things coming in three’s and repetitions, rather than strictly good, bad and ugly. Anyway, I had next to no time again this week (why are November and December always so damn full of stuff that eats your time up? ), but, I found a few minutes yesterday, just a few yards from the office and snap! 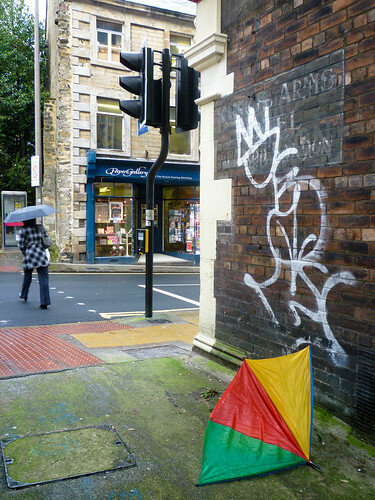 here’s my entry… I loved the discarded brolly in the alleyway, but when I moved into the alleyway to shoot from a different side, and noticed the red, green and yellow of the brolly repeating in the pavement and suggestive also of the traffic light colours, I knew that’s what I wanted, then it was just a wait for someone with another brolly up to come past – just a shame it was a black one!